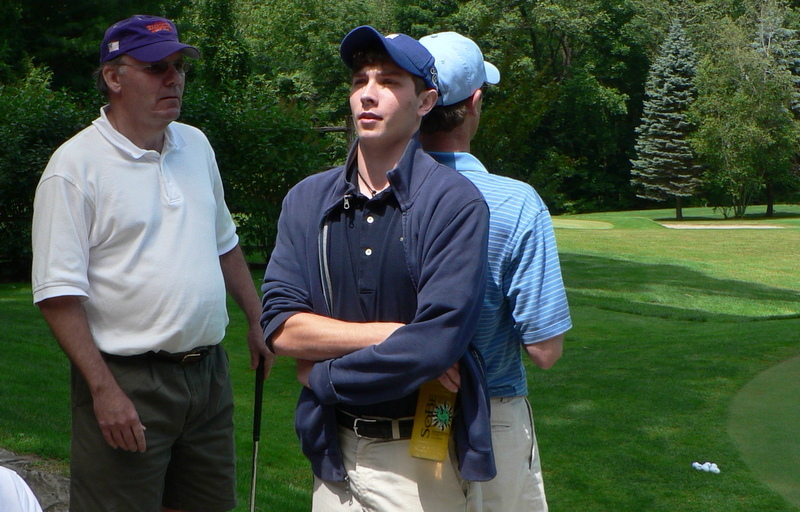 Brad (now our club president) making the official call on who is taller: Tim (light blue shirt) or Ben (with SoBe bottle), who is Tim’s son (and caddie). Summer, 2007. Many years ago, my friend Art caddied for my friend Jim in the chump flight of our club championship. When Art showed up on the practice tee with a damp towel draped over his shoulder, Jim’s opponent threw a fit. “You can’t have a caddie,” he said. “It isn’t fair.” Art’s handicap was very low, and Jim’s and his opponent’s were very high. With Art reading Jim’s putts, the opponent complained, Jim would have an unreasonable advantage. Our pro overruled his objection, naturally, and, using the rule book, proved to him that caddies are as much a part of golf as bunkers and casual water. Jim’s opponent remained upset, however. Conciliatorily, Art agreed to turn his back whenever he swung, so as not to make him nervous. Since that time, members caddying for members during important tournaments has become a tradition at my club—as I mentioned in my previous post. Friends caddie for friends, sons for fathers, fathers for sons, brothers for brothers, victims for victors. Caddying takes some of the sting out of the octuple-bogey that kept you from advancing to match play. It also turns an individual match into a team event, and, in a thought-provoking way, inverts the chemistry of rivalry. I’ve caddied for several friends over the years, and several friends have caddied for me; mostly, I’ve caddied for my friend Ray, who is one of my club’s best players. One year, when he and I met in the first round of a big tournament, we agreed that the loser of our match would caddie for the winner the rest of the way. That was pretty much the same thing as my agreeing that I would caddie for him, since he was the defending champion and I had barely survived the qualifier. And, in fact, that’s the way it worked out. Caddying is a challenge because it requires you to maintain a precise but shifting balance between involvement and invisibility. My worst failure as a caddie came during the final round of the club championship one year, when, intoxicated by the emotion of the match, I loudly disputed a rules interpretation made by our pro. My biggest contribution occurred during the same tournament a few years before, on a par-5 where Ray had hit his drive into a terrible position from which to go for the green. Ray is a stubborn, aggressive player, and he doesn’t like to lay up. He took a long look at his lie, though, and said, morosely, “I guess I should just knock it down there with a wedge”—the sensible play, and, as he knew, exactly what I myself would have done. But I swallowed hard and said, “That doesn’t sound like you.” The gloomy look vanished from his face. He took his three-wood, and—from a sidehill, downhill lie—hammered his ball just short of the green. It was a dangerous shot, which I would never have attempted and could never have pulled off. But (as I had to keep reminding myself that day) I wasn’t the guy playing the match. This entry was posted in Sunday Morning Group, Uncategorized by David Owen. Bookmark the permalink. Do you find that caddies that are players can provide more insightful advice? Are professional caddies golfers too? There are excellent caddies who are excellent players, and excellent caddies who don’t play at all. The most important element in a caddie-player relationship is probably a kind of personal harmony. A good caddie can make you play better–not by fixing your swing problems or reading your putts but by keeping you in a good frame of mind and sort of magically absorbing the aftershocks of things that go wrong. It’s one of the most interesting relationships in sports, and the golf part is probably its least important element.